I had intended to write a newsletter as November wrapped up. In the closing days of November, the market had gained back about 40-50% of the recent losses, and things were looking up. I was preparing to write that perhaps we had turned the corner. Worry that the Federal Reserve would raise rates TOO FAR, TOO FAST and dent economic growth. There can be very credible arguments made that the FED has caused several recessions by doing just that. The ongoing trade dispute/negotiations with China. By late November, several Federal Reserve officials had ‘walked back’ earlier more aggressive comments about how fast they intended to raise rates. This was good news, the Fed should be data dependent and continually adjusting policy based on actual conditions, instead of preprogramming moves far into the future. A weight on the market had been lifted. Then trade took center stage again. Trump met with the Chinese Premier. Nice things were said. Hooray! then two days later various Trump administration officials said sort of different things… Larry Kudlow said something to the effect of, “Things are great, great progress is being made, all is well, or will be well”. 110% upbeat. The same day another official said sternly that if no substantial agreement is made within 90 days then the tariffs on many Chinese imports will be immediately raised to 25% from 10%. No extensions. Then, Trump himself said in a tweet, that he is a “Tariff Man”, and believes in and enjoys charging tariffs. Market participants decided that this was a mess and that higher tariffs might really be on the horizon. Higher tariffs raise costs, could slow growth. The market sold off another 2-4% but still above the lows of February. Befriend your opponent. Hug them, say nice, upbeat things, tell them they look and smell great and a wonderful agreement is possible. Tell your opponent that the deal is very very close, so close and you can quickly get things ‘sewed up’. Tell your opponent there is a wide distance between you, and you don’t care if the deal is done. You might even prefer to walk away. Mix and repeat over and over till they are worn out. The goal is making your opponent tired of the whole thing and move your way to get it over with. You may or may not like President Trump, However, it cannot be denied that in his business career he negotiated financing and other terms over and over that left him with most of the gain if things went well, and little of the risk if a property or business headed south. These negotiations were with very sophisticated people in a position to loan or invest hundreds of millions of dollars, not amateurs. I explained that to say this: I believe the general media opinion that this is a confused mess, and that there is no real strategy, and thus little hope of a useful resolution is wrong. I am not predicting 100% success, or a real ‘heart change’ from Chinese leadership. I do, however, believe that these different messages are part of Trumps standard negotiation strategy to bring your adversary down the road a bit, and then create fear that the deal might fall through, so they then come your way some more. Create a gap, let them come your way, create a new gap. They get worried about the deal, and you act like you don’t care, and then they creep your way to keep the deal alive. (while reviewing the above I am not suggesting President Trump is generally operating from a position of self-control or discipline (don’t laugh), but in matters of economics, and negotiation he is in his element). Again, I am not predicting a giant breakthrough. The Chinese leadership have no moral qualms about stealing property, secrets, and more from anyone anywhere. These folks also don’t face elections or the rule of law… except one law. The law of supply and demand. We have a $500 billion dollar a year trade deficit with China. If China loses access to our market, they have a big problem. A problem so big the Chinese leadership is rightly afraid. I believe that we will get some sort of partial victory and that is all we can expect. China will lower barriers, reduce industrial spying, and otherwise make nice for a while. Trump will claim victory. The Chinese already resumed buying US soybeans and offered to reduce tariffs on cars imported from the USA. They are making concessions. More are coming. I am investing with this outlook. I am not betting the farm, but I am investing expecting a recovery of stock prices with the ‘settling’ of this issue for now in the coming months. What if Trump is removed from office? Then we get Pence who is far more hawkish on China than Trump. This policy has a few more years at a minimum. Long enough for China to feel the pressure and see manufacturing business move to other countries. Then can’t afford too much of that. Additionally, the market hates uncertainty. But over time, gets somewhat more comfortable with it. Often, when a new worry presents itself, the market sells off quickly, but then slowly comes to grip with the issue and climbs back. This has happened over and over, including earlier this year when the China and Fed issues first cropped up. Economically speaking, the US economy is still firing on all cylinders. Employment is perhaps the best in modern history. Interest rates and taxes are low. Fuel costs are low. Inflation is low. Corporate profits are still (with the China issue) expected to grow 5-8% next year. 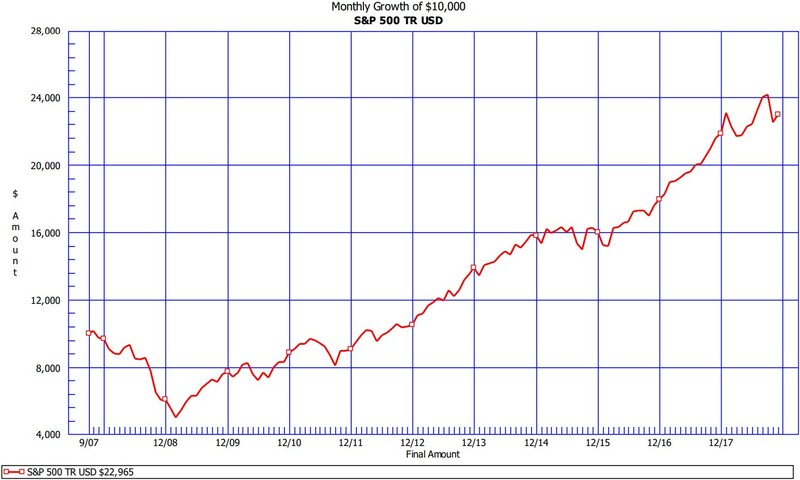 Growing profits support growing stock prices. Few respected economists predict any recession before 2020 or later based on the momentum of our current growth. With that backdrop, I must overlook some of this noise and selling and position accounts for the expected reality 6-12-18 months out. I know the declines hurt. They hurt my accounts too. The larger risk though is losing sight of the long-term trends. Below find a 25-year chart of the S&P 500. It is up over 1,000% with dividends. Don’t think you have 25 years? 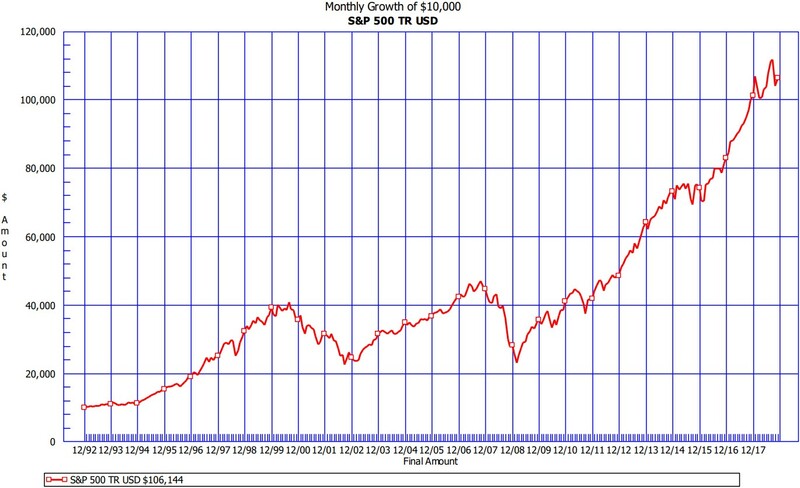 See the 11-year chart below. This time period was picked as the worst possible time to begin, at the market peak in 2007, before 2008, the worst market in 80 years. If you started at the worst possible time in recent history, you be up almost 230%. The first 11 months this year have been bumpy and unprofitable, but it has not generally produced real losses, just small gains, by way of two declines erasing 6-9% gains in February October. Our November 30th composite (all client average) performance report is attached. These numbers are not cherry picked, the Bullseye Composite is after all fees, and includes recent declines. Our gains from 2016 and 2017 are intact. One other note: Despite what you might think aggressive clients are doing better this year. While more volatile, tech stocks are still out-performing and aggressive clients have more exposure to tech stocks. The above said, I am making some adjustments for the increased volatility. I have made some new allocations to higher dividend stocks to increase portfolio income. If the market is going to bounce around a while and basically move sideways or trade in a range, earning more dividends can be a good strategy while we are waiting for prices to advance. In have added or increased positions to EOI (pays a 7% dividend), At&T (T- pays a 6.7% dividend) and others. I am also changing our technology exposure. I have switched to a ‘software only’ tech ETF (IGV). Software is not imported from China like tangible technology products (computer chips and iPhones). Software is also more profitable at a large scale than tangible products. I am really excited by this move. I have also added a bit to Biotech. This is a volatile area, but has great growth potential, and the recent declines I viewed as opportunity to add to the excellent biotech fund we use (the #1 biotech fund in the county as of this summer – out of 98 funds!). I believe in the near term and long term that early stage biotech companies will remain attractive acquisitions for the major drug companies that need new products, and are flush with cash re-patriated from overseas recently. Lastly, I have increased our allocation to what I call ‘general blue chips’, by decreasing Tech a bit. I am using two different ETFs that have both earned more than the S&P long term with slightly less risk (products- FTCS – First Trust Capital Strength, and DGRO- iShares Dividend Growth). What Have I Not Changed? I have continued to hold our position in IHI- The iShares Medical Device ETF. This fund invests in companies that make pacemakers, deliberators, artificial knees, artificial hips and medical or hospital systems. I consider this area somewhat recession resistant, and a long-term growth area due to demographics, and advancing technology. I continue to avoid traditional bonds, instead using mortgage securities (IOFIX) and floating rate loan funds (FTSL). These products have performed far better than traditional bonds the last few years due to having either the potential to pay higher interest rates that adjust up if rates head up generally or offering a different risk profile. There was a lot to communicate. I hope this helped. This longer newsletter increases my typo potential, but as always, typos are included at no extra cost. As mentioned in the last newsletter, I am shopping our custodial relationship. I don’t want to change but need to compare trading costs and service levels. At this point, I am still investigating, but am somewhat less inclined to leave as benefits of leaving TD Ameritrade are less clear than last month. I am looking at several firms, Interactive Brokers, Trust Company of America – owned by E-Trade, and Cambridge Investment Research of Iowa. The state of Ohio is communicating their priorities for regulation of investment advisory businesses moving forward. The priority is going to be formally updating suitability information for all clients every three years. This means confirming your investment goals, risk tolerance, reviewing major life changes, and updating information on income, and net worth. I will begin this project in January. I may use an email based or web-based system to quickly get this information updated. If you would prefer using paper or meeting in person to review these items, that is fine, just let me know. As always, contact me with any questions, to review your account results, or to discuss changes in your investment goals, risk tolerance or life circumstances.